Tis the season for bright green Shamrock Shakes, sweet minty treats, and green beer! St. Patrick’s Day isn’t a huge deal for me; I’m not a huge fan of the “let’s go out and drink until we make fools of ourselves or cry” movement typical of the average college folk, so St. Paddy’s Day is a pretty low-key day for me. Pittsburgh actually has a pretty popular St. Patrick’s Day Parade where people dress up in their “Kiss Me, I’m Irish” shirts, wear crazy hats, and drink until they’re…well, green in the face. It’s very festive. While artificially-green food isn’t really my style, I figured I could bring a bit of the green St. Paddy’s cheeriness to Fooduzzi by way of some fresh herbs. And not just any herb; I’m talking about the king of all herbs: Basil. Growing up, my favorite food in the world was pesto pasta. Coming from a traditional Italian family, pesto was a quick and easy go-to dinner for our crazy busy schedules. Fun fact: on my last day of my three-month-long stay in Italy, I actually ordered a huge plate of homemade pesto pasta and, I kid you not, it was the single best thing I had ever put in my mouth. There’s just something so special and enchanting about this simple herb sauce that lures me in every time. And what do you do when you find something you love? Set it free Throw it into hummus! There are two ingredients that make hummus that creamy, delicious spread we all know and love: 1. Chickpeas & 2. Tahini (a sesame seed paste). Chickpeas serve as the thick and velvety base upon which we shall build our flavors. I just love these wonderful, little, protein-filled beans. 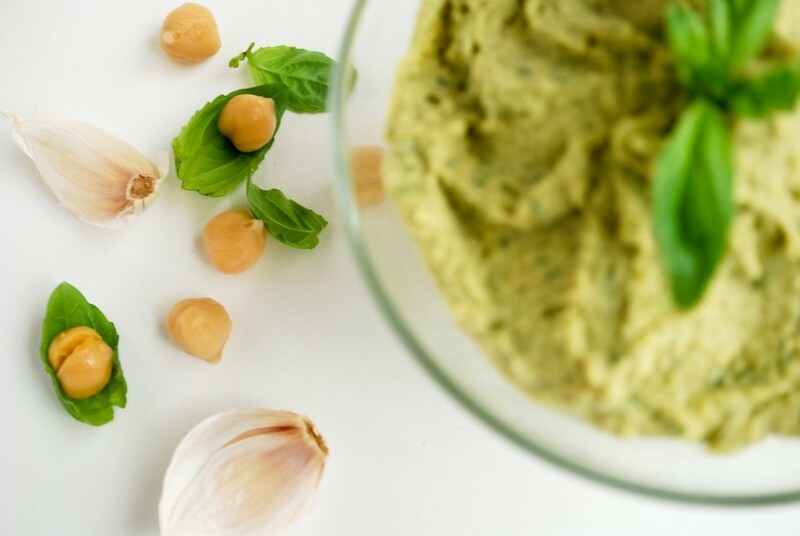 With this Pesto Hummus, #2 is a little different, as we’re substituting the tahini for…homemade walnut butter! Walnuts are a common addition to a traditional Italian pesto, so we’re just going to substitute one “butter” (the tahini) for another (the walnut butter). Walnuts are full of vitamin E and healthy fats, so don’t be disappointed when I tell you there will be some leftover walnut butter after your hummus is made. Use it just like you use peanut butter or almond butter (i.e. spread it on everything). We will need just one clove of garlic to perfume and flavor our hummus. Garlic is one of my favorite flavor bombs, and the fact that it has antibacterial properties? Just an added bonus. Because it’s a Pesto Hummus, basil is our go-to-herb. It’s sweet. It’s fragrant. It’s herby. There isn’t anything better. Last, to smooth our our hummus mixture, we’re adding 2 Tbsp. of ice water and 1 Tbsp. of extra virgin olive oil. These two additions take this hummus to a magical fluffy and velvety hummus land. It’s a wonderful place to be. Oh, feel free to throw in a handful of parmesan cheese or nutritional yeast right at the end of blending. I was going to add some, but I thought the flavors were spot-on without. 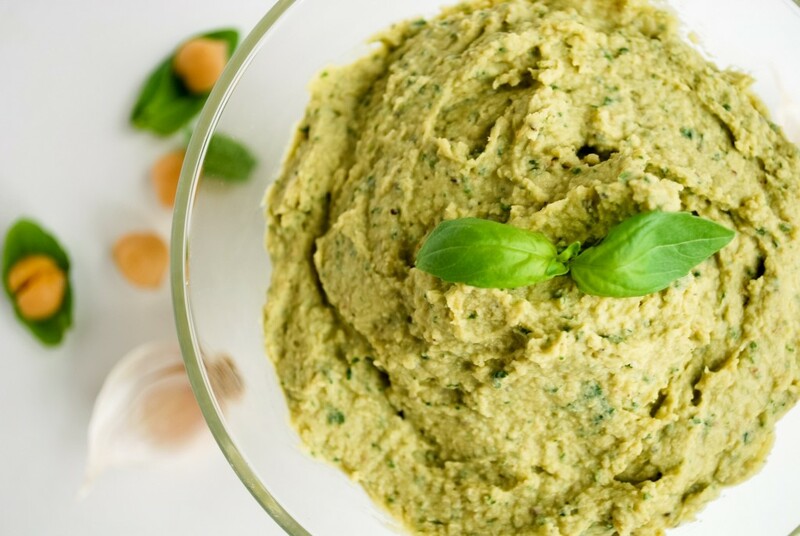 Add some green to your diet this St. Paddy’s Day via this sweet and garlicky Pesto Hummus! It’s healthy, made of whole foods, and so incredibly flavorful. I think this may just be my favorite recipe to date! It’s so easy being green with this Pesto Hummus. 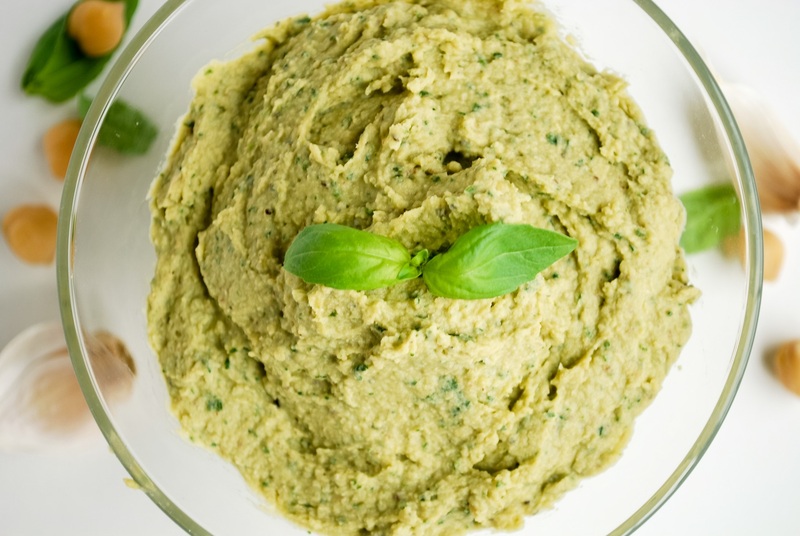 Packed with garlicky basil flavors, this Pesto Hummus is a summer staple! Make the Pesto Hummus: Wipe out the food processor with a dry paper towel to remove any big chunks of walnuts. Add the chickpeas, salt, pepper, 1 Tbsp. of walnut butter, and garlic clove, and process on high. While processing, add water and olive oil. You may need to scrape the sides of the container so that everything is incorporated and smooth. Once smooth, add basil, and process until combined. There should still be flecks of basil in the final product. Add nutritional yeast or cheese if desired, and process until combined. Serve with veggies, crackers, and/or green beer. *You will have leftover walnut butter. Either make a ton of this Pesto Hummus, which you will want to do after one bite, or use it as you would any other nut butter (i.e. spread it on everything). Thank you so much, Kathy! It’s one of my favorite recipes!